At 6 Ranch, Liza Jane McAlister raises grass-fed beef with her daughter, Adele Nash, on the ranch her great-grandfather homesteaded in 1884. In addition to grass-fed beef, 6 Ranch has a meat CSA that includes farm-raised lamb, pork, goat and chicken. Liza Jane’s Farmstand offers local eggs, bread, honey, vegetables and beef for sale — all on the honor system. “Our passion is raising food that we’re really proud of, that’s good for the land and good for people," McAlister says. “We’ve learned from generations before us who were on this exact same piece of land,” says Nash. Liza Jane’s Farmstand is perched on State Highway 82, which winds its way to Wallowa Lake in Northeastern Oregon. The weathered Dutch door is always open and offers local eggs, bread, honey, vegetables and grass-fed beef for sale — all on the honor system. 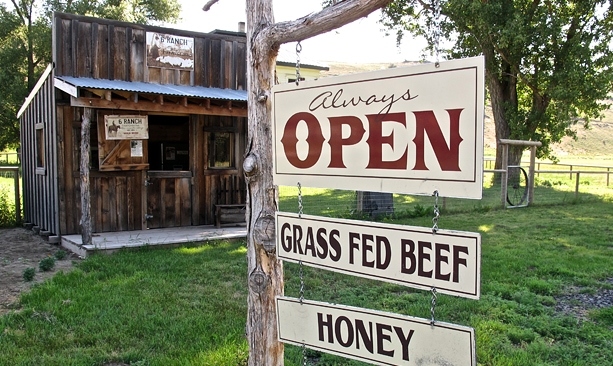 No larger than a child’s playhouse, this small farmstand represents the big vision of a mother-daughter ranching team doing business as 6 Ranch. Over morning coffee, Liza Jane McAlister remarks that the partnership with her daughter, Adele Nash, began at birth. She says she raised her daughter and son, James, in the pickup and on horseback. Sitting next to her mother, Nash nods and remarks that from an early age she and her brother had a real stake in the whole operation. 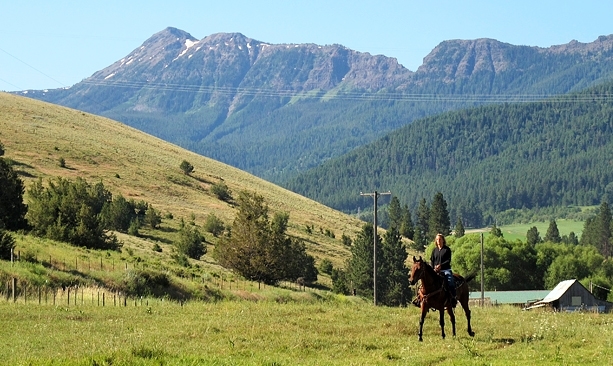 Today mother and daughter are homing in on their long-standing dream: to build a resilient family ranch. 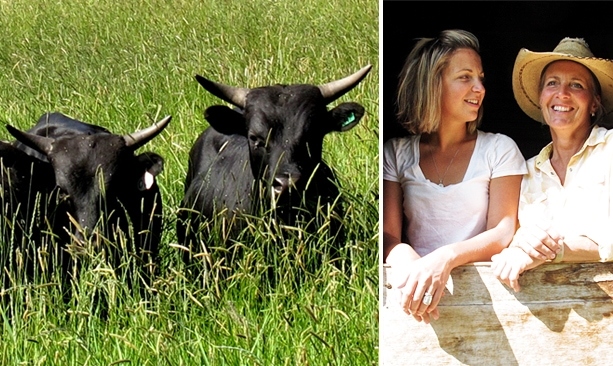 6 Ranch now raises grass-fed beef for loyal customers from Spokane to Portland, and have set their sights on producing a diverse offering of sustainably raised foods. 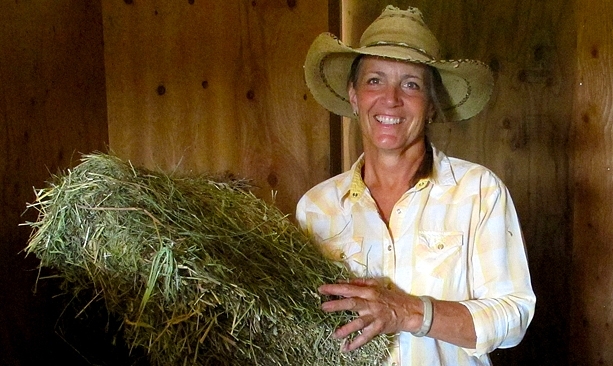 As the only girl in a family of five kids, McAlister was lucky that none of her older brothers took to ranching. Fresh out of Oregon State University 27 years ago, she claimed the family lands homesteaded by her great-grandfather in 1884 and held onto them through many careers, ranging from social services to land steward for the Nature Conservancy. 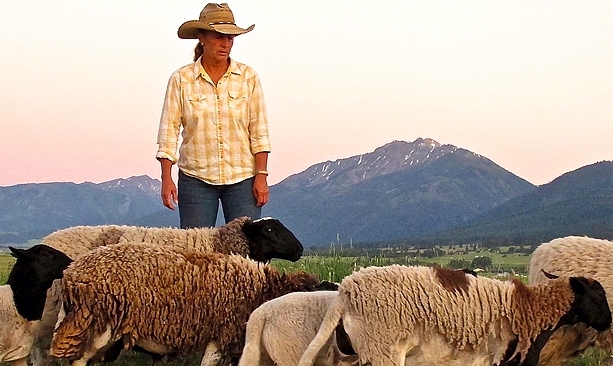 After Nash, now 25, returned to the Wallowa Valley in 2011 with agriculture and culinary degrees, the pair formalized their partnership with 6 Ranch, LLC. “People always ask, ‘Just you and your mom?’ Well, we have our dogs,” Nash says. 6 Ranch is renowned for raising registered Corriente cattle. This heritage breed is descended from the first cattle brought to the Americas by the Spanish in the 15th century. The cattle’s most striking features — aside from their small stature, compared to the typical Black Angus — are their horns, which are both broad and sharp. “Our cattle have these amazing weapons attached to them,” Nash says. On a summer morning, the pair appear as fearless as bullfighters in the ring working the herd on foot. McAlister commands her border collie, Albee, to gather and move a group of bulls toward the corrals. “Behind!” she calls, and the dog circles behind the trotting hooves. In conversation, McAlister and Nash banter, tease and laugh like best friends. But while McAlister directs Albee, Nash remains silent, watchful and patient. “Come by,” McAlister shouts, and her dog circles right. “That’ll do,” McAlister says, as the bulls trot through the gate and the dog comes to rest at her feet. Nash points out another unique feature of Corriente, best known as sport cattle for rodeos. “They love to move,” she says. 6 Ranch leases out yearlings as roping stock for rodeos. They also sell registered bulls for breeding. The Corrientes’ natural agility and adaptability make them ideal for 6 Ranch’s rugged terrain. The cattle forage adventurously from river bottom and forest to basalt rims. They require little water and are able to withstand the weather extremes of the Wallowas. McAlister says, “Mother Nature is my boss.” Therefore, the self-reliant mother cows of 6 Ranch calve not in late winter as on other ranches but in May, along with the deer and elk. Aside from their morning coffee, every day in the lives of these grass-fed beef producers is different from the one before — unpredictably so, and so is every season. In summertime there are cattle to herd on horseback according to a grazing plan that will stimulate native grasses and control invasive weeds. There is irrigation pipe to move, horses to train, produce to pick and eggs to collect. There is marketing and financing, fixing and cleaning — always fixing and cleaning. But often the work waits when visitors and customers arrive for a ranch tour, complete with a roping demonstration. Through it all, mother and daughter eye the long game. In just two years, they’ve added a greenhouse, the farmstand and a sheep herd for pasture-raised lamb to complement their grass-fed beef. Three supermarkets and two restaurants keep up demand for their beef, which they also sell at farmers markets. The pair’s most recent ventures are a meat CSA, which includes 6 Ranch beef and lamb plus local pork, as well as goat and chicken boxed for pickup and mixed-beef boxes shipped anywhere. Together mother and daughter anchor the ranch, each in homes on either end of the 1 mile of State Highway 82, which bisects their ranch. Digging deep and pooling resources and talents, they are working better, not bigger, to support their business and lifestyle. Extend your stay: Spend a few days exploring Eastern Oregon. Book a room at The Bronze Antler Bed & Breakfast in Joseph or the 1910 Historic Enterprise House Bed & Breakfast. I'm a city lover, but I moved to one of the most remote places in Oregon to live at the edge of the wilderness in a community of ranchers, artists, and independent types like me. Since I'm a food writer, I blog about eating and the rural lifestyle. My biggest project to date is the cookbook, "Pure Beef: An Essential Guide to Artisan Meat with Recipes for Every Cut" (Running Press, 2012).